Director Thomas Durakis (American Bible Society) has agreed to read and review the two volumes of Dr. Dan Costian's Bible Enlightened: Religions and Yoga recently published by PA.
More requests for Dan Costian's"Bible Enlightened: Religions and Yoga"
The recent PA published two-volume-book," Bible Enlightened: Religions and Yoga"by Dan Costian was requested also (see previous request on December"What's New") by Peter Ruhe, Chairperson of the GandhiServe Foundation in Berlin, and by David and Michelle Riklan, Self Improvement Online, Inc., Marlboro, NJ. "Bible Enlightened: Religions and Yoga"got a hearty welcome from the British and Canadian readers of books dealing with Yoga. Just a month after its release, Blackwell.co.Uk granted Dr. Dan Costian's two-volume-book the first place among the most popular titles, according to page views by customers, in the Yoga category. According to the bestselling criterion within the same category, the book is ranked 105 in Canada by amazon.ca out of 1867 books on Yoga. 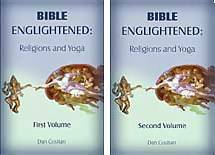 Dr. Dan Costian's two-volume book, Bible Enlightened: Religions and Yoga, was a bestseller for Amazon.fr (France) as it was ranked #15 among the books on Yoga. Images have been used long before written signs were invented for communicating ideas. The visual impact always was stronger that the one produced when reading a text. Hence the decision to print the THIRD VOLUME on Religions and Yoga (meant to enlighten not only the Bible but other Scriptures as well) that includes illustrations to the previously published compilation. The THIRD VOLUME of the"Bible Enlightened"Includes about ONE THOUSAND pictures (80% of them in full color) providing a very useful supplement of information and a real support to the ideas expounded in the former two volumes. Some of these pictures were projected in a Power Point presentation at the"Sheraton Hotel"In Los Angeles during the seminar preceding Navaratri Puja. Many Sahaja Yogis who have watched this presentation have expressed their desire to obtain the presentation. This book offers the possibility to acquire the pictures assembled in a book designed for an easy perusal. This THIRD VOLUME is organized according to the sequence of chapters, and the page numbers of the related text in the first and second volume are provided for every image. The illustrations are accompanied by explanatory captions. Notes and credits to all the pictures are given at the end of the book. I hope you will all enjoy the THIRD VOLUME including beautiful and at the same time highly revealing images gathered in its pages. Bible Enlightened was published so far three times in three countries. The first edition was printed as an abridged version in India (December 1995). The second, enhanced edition, organized in two volumes, was printed in Romania (vol.1, 1998, vol.2, 2001). The third and definitive edition, in two volumes, was published in the United States in December 2003 by PublishAmerica. PublishAmerica currently offers a promotional sale of the set of two volumes for just 39.95 USD (not including S&H), which is a 20% discount over their original price (49.95 USD). All other online distributors (Amazon, Barnes and Noble, etc.) ask for 49.95 USD for each volume which comes to about 100 USD for the set. - the book includes now the result of extensive researches performed during the last 8 years, mostly in American libraries. - all the references (including those gathered from sources dating to 2003) were moved from the text body (in the first edition) to notes at the end of each chapter, thus making the text more readable. The book is structured in two volumes, the first one dealing mostly with the Old Testament, while the second volume is devoted mainly to the Divine Son and the Divine Mother. The work introduces the reader to a challenging new perspective, offering a fresh and far-reaching point of view on the mystical side of yoga as compared to world's religions that explores how Eastern and Western spiritualities support and complete each other. It is based on many years of vast research and travel around the world. Besides thoroughly analyzing the Bible (Old and New Testaments) in connection to other Scriptures pertaining to Islam, Hinduism, Buddhism, Taoism and other religions, as well as esoteric doctrines such as Kabbalah, Sufism, Hesychasm aiming at discovering their deep, hidden essence, the author resorted to a wealth of documentary sources. However, beyond the inherent historical approaches, the work is focused on phenomenology with the aim of highlighting the common ground shared by the great religions and yoga spirituality. As a scientist, the author expanded the breadth of the subjects covered in the book, bringing together knowledge not only from scriptures but also from science (mathematics, physics, astronomy, anatomy and physiology and other scientific resources), as well as historical facts, geographical surveys, results of archaeological findings, mythology, art history, analysis of folklore and ancient traditions, comparative linguistics especially of ancient languages. In this day, Western seekers are interested in what the East has to offer in the realm of spirituality. This book can be a bridge between the East and the West, a signpost leading the seekers towards the essential synthesis they are looking for. The intended audience includes readers in spirituality, world religions, yoga and meditation. The opening idea is that the essence of the main spiritual traditions is common since inspired by a unique God. The introduction aims at expounding the historical and geographical framework of ancient India, source of a millenary spiritual heritage. Then, the reader is presented with the Hindu concept of cosmogenesis compared to other sacred writings. In this mythology, the primordial word plays a distinct role. The relationship between God and his image reflected in man is explained through the system of subtle centers (chakras) and channels (metaphorically portrayed in the Bible, the Qur'an, the Kabbalistic and Gnostic texts) enlightened by the spiritual energy (Kundalini). Many scientists accept the holistic concept relating man and universe, and even try to prove scientifically the existence of God. The subtle system is usually depicted as tree, menorah, cross, ladder, staff, and multi-story edifices. A hypothesis about the ancestors of the Hebrews coming from India is analyzed in chapters related to the Eden, Flood, vestiges of Moses and Solomon east of Palestine and their connection to the descendants of the"lost tribes of Israel"living in Kashmir. A universal system of divine inspired rules (dharma) lies at the basis of any great religion, the Decalogue being just one example among others. Moses' miracles, the serpent-staff and brass-fiery serpent could be explained through the Kundalini manifestation depicted as a snake, a spiritual symbol of knowledge and wisdom widespread since Neolithic and Chalcolithic, worshipped in Old European, Egyptian, Hindu, Chinese, Minoan, Greek and pre-Colombian civilizations. The universal principle of the spiritual master was manifest in great prophets and sages such as Abraham, Moses, Zoroaster, Lao-tse, Confucius, Socrates, Muhammad, Janaka, Nanak, and Sai Nath of Shirdi. The Spirit of God explains the ability to prophesize of all genuine Realized souls. In order to keep it secret, various scriptures described the manifestations of the Kundalini as cool breeze, water of life, light or cold fire, the latter represented by enlightened artists in their masterpieces. The worship of God concludes the first volume. The place, time, preparations, invocations, sacrifices and offerings as well as other rituals are thoroughly discussed. The Divine Son: Jesus, an example of avatar (like in other traditions), was announced by prophecies, and recorded in the Scripture (giving a poverty of details, often contradictory) even by (more or less) contemporary authors. Such avatars manifest the principle of spiritual evolution revealing their attributes specific to the attained stage of spiritual development within cosmic cycles (Hindu yugas as well as eras of astronomical precession of equinoxes). The avatars have their correspondence in the universal and human chakras endowed with specific qualities. Prophecies about the present transition to a new era proclaim the advent of a new great incarnation. The Divine Mother: All the non-Hebrew ancient people worshiped the Goddess. However, a careful analysis reveals her concealed presence all along the Old Testament. In the Bible Enlightened, The Divine Mother in the New Testament has granted a large space dealing with Virgin Mary's modest place in the Scripture due to Peter and Paul's misogyny inspiring the Church, and the contrasting position of widespread popular piety devoted to her. The Gnostics revered God The Mother, too. A special section discloses the high respect paid to the Divine Mother in Islam. Last but not least, the Holy Spirit points to the Divine Mother (Goddess) as well. The grace bestowed on Jesus by the non-created energy of the Holy Spirit explains his powers first manifested at the baptism (the second birth) enabling him to perform healings and exorcism. The reader is faced with an exciting question (Did Jesus Live in India?) and confronted with many writings. Holger Kersten (followed by Elizabeth Clare Prophet and others) broadly publicized their investigations on the matter. However, such works might appear amateurish if compared to the erudite works of Khwaja Nazir Ahmad (preceding the former two) or Fida Hassnain and Dahan Levi (posterior to Kersten's book). A thorny matter concerns reincarnation. Its traces left in the Bible are reviewed in comparison with other sacred texts and the favorable opinions of several writers and public figures. Union with God, a primordial human aspiration, and its manifestations within the esoteric trends of Christianity, Islam and Judaism are investigated in the last chapter.